Johnson » Roger Perron Inc. 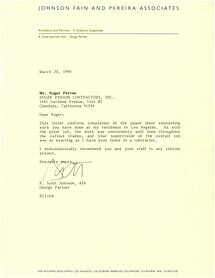 This letter confirms completion of the upper floor remodeling work you have done at my residence in Los Angeles. As with the prior job, the work was consistently well done throughout the various trades, and your supervision of the overall job was as exacting as I have ever found in a contractor. I enthusiastically recommend you and your staff to any similar project.